Driving up the freeway yesterday, listening to public radio, I heard a great segment on, "The return of the mixtape". Apparently the mixtape is making a comeback. People are once again putting together themed compilations for themselves and loved ones, and additionally for mixtape competitions and festivals. The interviewees recently hosted a themed mixtape competition in San Francisco and have an active mixtape society - consisting of both young (born after the cassette tape era) and old (record store goers). The interviewer also reported an alternative band had just released its newest record on cassette tape!?! I smiled as I listened. I flashed on my own mixtape memory. I was in high school again, riding "shotgun" in my best friend's prelude, cruising around with my 3 best friends, music cranked, sunroof open; I felt the Florida wind and sun on my face. My friend shouted from the back seat, "put in the mixtape". All four of us laughed and cheered. There was always a new mixtape, but there was one in particular she always requested. This mixtape we played so frequently in fact that we still talk about it today, and when we do, we refer to it as simply THE mixtape. THE mixtape music had strong meaning for us, and thus it had power. It meant laughter, love, and belonging; it just simply felt like home. Music has this unique way of inspiring feeling. It seems to change us on a cellular level; music vibrationally changes reality. "Music is the religion of the future", said Reverend Michael Beckwith. Music can bring us up, touch us deeply, transport us out of time and place. Music is a remarkable vehicle into imagination, memory and reality creation. For these reasons, music and the mixtape are invaluable therapeutic tools. As a therapist, I'm all for the "return of the mixtape". When patients come to see me they often are not happy with their current theme song. Most of us carry a "story" about who we are, what we stand for & what life is about. It's usually based on our relational history and events of the past, but primarily it comes from our interpretation of the past and thus our current perspective and expectations for the future. "That's the story of my life" we say. Create a new story. Find a theme song(s) that supports your new "story". You, and only you are in charge of your life, we perpetuate our current reality by playing the same old song. 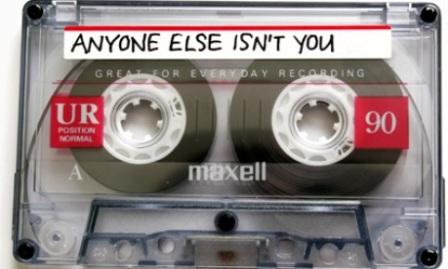 Create a "mixtape" or a "mixCD" of tunes that inspire you. Play it every morning on the way to work. Listen to it when you lose your way. Perhaps you compile a feel good mixtape, a gratitude compilation, love songs, break-up songs, soothing songs- whatever it might be that supports your story.